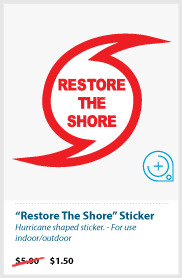 Like our fan page to get more news & updates on our "Restore the Shore" campaign. - EVERYTHING MUST GO! 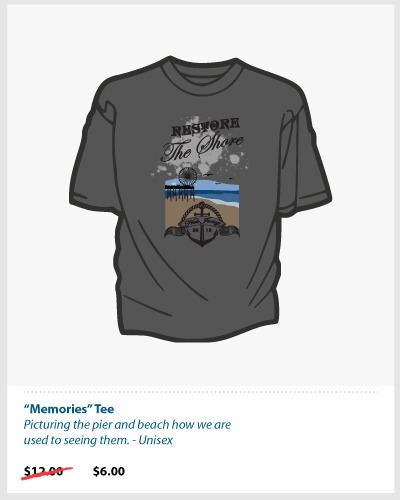 NEW CLEARANCE PRICING ON ALL RESTORE THE SHORE MERCHANDISE. IF PRODUCT IS OUT OF STOCK, WE WILL NOT BE GETTING ANY MORE IN. PURCHASE TODAY WHILE SUPPLIES LAST! 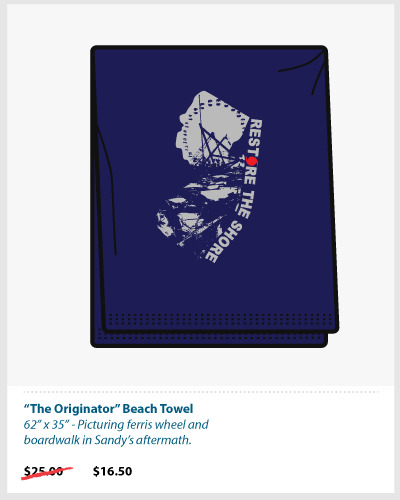 - Sport your new "Restore the Shore" beach towel at the beach this summer and show your pride in New Jersey and your support for the Jersey Shore. We have a limited quantities of these left, so order today to guarantee you receive one in time for the summer! 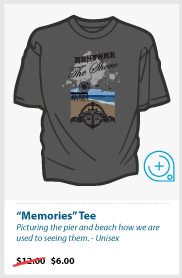 - Currently our trademark for the "Restore the Shore" is the only LIVE trademark that is current on the USPTO website. 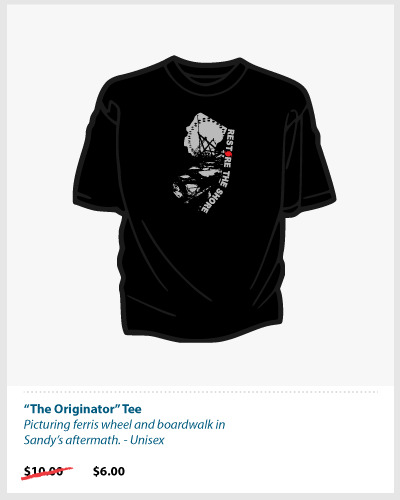 We are in process of finally getting it approved, as we were the first to coin the phrase and use it in commerce after Hurricane Sandy. Our intentions of the trademark was and will always be to weed out those companies who are making a profit on the term and deceiving the public by stating they are donating the proceeds. 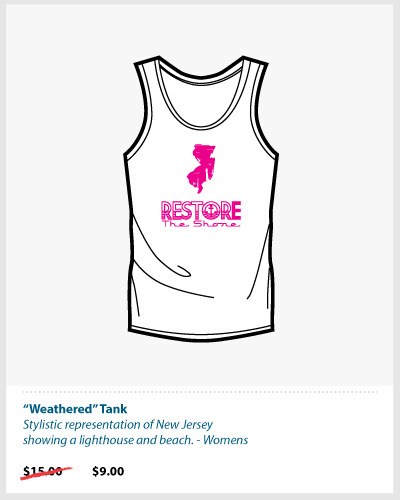 - As of right now, we do have plans to continue the Annual Restore the Shore 5K. 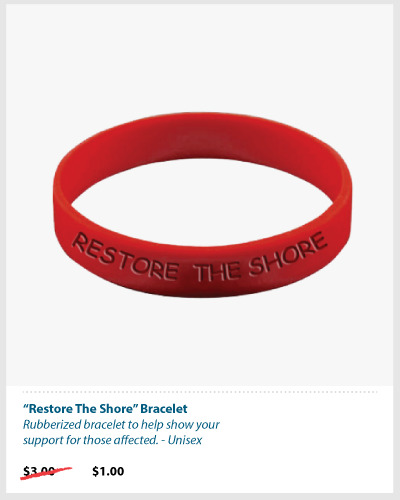 Please visit www.restoretheshore5k.com frequently to check for updated information for the Restore the Shore 5k. - Please check our FAQ on the right for INTERNATIONAL orders. - Please read our FREQUENTLY ASKED QUESTIONS on the right. There may be an answer to a question you may have about your order status. - We currently have no retail locations setup or cash & carry events scheduled. Orders are currently online order only. - All our Volunteers for helping us out! And YOU for all your support! Late last Thursday night, a large fire broke out in the building where our company first started. During our 5 years at this office, we became close friends and colleagues with many of the other businesses who shared this space. In that blaze all of our friends and colleagues had lost everything including all their business documents, memorabilia, electronics, and office equipment. Our close friends at Hometown Heroes?, whom have done outstanding and tremendous work in helping families recover after Hurricane Sandy, were one of the many who have lost everything. As you may or may not know, Hometown Heroes is the 501(c)(3) non-profit whom we have donated all our Restore the Shore campaign proceeds to. At this time they are in need to help rebuild their offices and contents in which they lost. 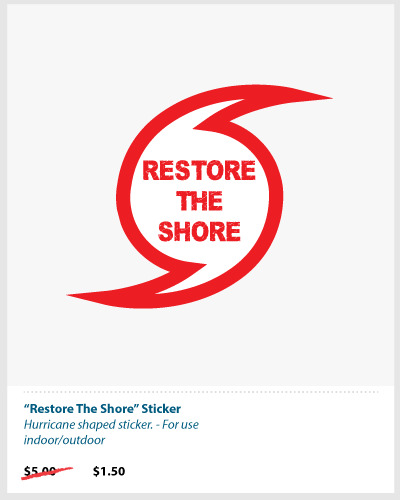 We are opening up our donations section on our Restore the Shore website (www.restoretheshorenj.com) to donate to help them rebuild. Please use the "Just Donate" button and include a memo that states that your donation is for Hometown Heroes. All donations that come in will be donated to help Hometown Heroes. You may also directly donate to Hometown Heroes on their website at http://usahometownheroes.com/donate. 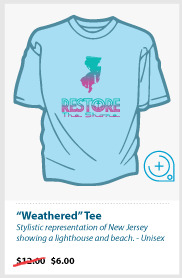 Any Restore the Shore apparel proceeds will still be used for the Hurricane Sandy fund, just make sure you memo the "Just Donate" for Hometown Heroes or directly donate on their donation link above. Thank you all for your help. As a New Jersey (Toms River) local business, GlobalTech East Inc. (GTE) wants to do its part to help out in the midst of this current tragedy. Hurricane Sandy ripped through this state and left a massive path of destruction in her wake. Thousands of people are left without food, water and electricity, and in many cases have even lost their homes. GTE wants to help by offering these high quality Tees & Hoodies and other items to anyone who wants them! 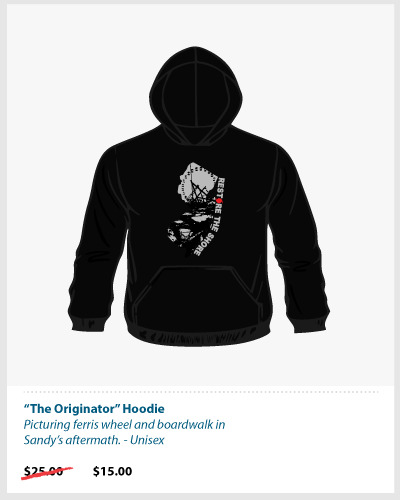 The Tees & Hoodies are available in different designs & sizes. 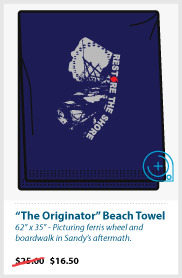 We also offer other products such as Beach Towels, Stickers and Wristbands. 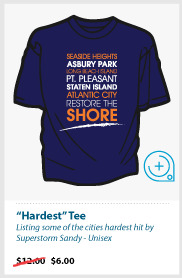 100% of the net proceeds are donated to Hometown Heroes, a local NJ Non-Profit Corporation 501(c)(3). Hometown Heroes has been helping out Sandy victims since the storm hit. For more information on Hometown Heroes, visit their website at www.njhometownheroes.org. 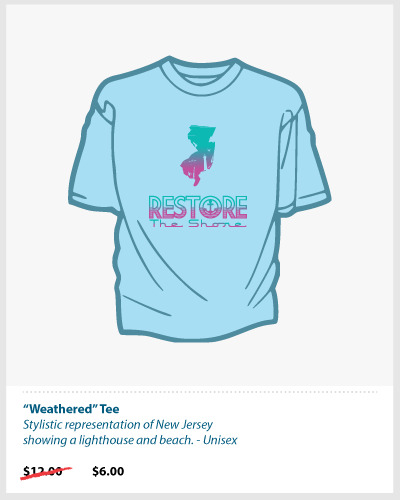 If you would like to do your part, please purchase one or more of our "Restore the Shore" apparel and/or items and we will see to it that the money is given to the people who need it most. If you would like to just donate any dollar amount, please click on the "Just Donate" button above the ordering area. 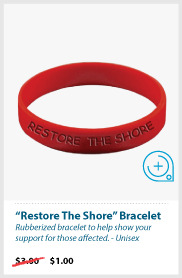 Where is 100% of the net proceeds being donated to? We have been donating 100% of net proceeds to Hometown Heroes, who has been helping Sandy victims since the storm hit. Hometown Heroes is a local NJ Non-Profit Corporation 501(c)(3). Tax exempt number: 26-432728. More information can be found by visiting their website at www.njhometownheroes.org. Do you have any retail locations or cash/carry events? Retail locations and Cash & Carry event information can be found at the bottom of this web page. NO, you do not need a PayPal account to purchase. When checking out, please choose the "I Do Not Have A PayPal Account" option to purchase using your Credit/Debit card. Orders are guaranteed to ship within 7-10 business days of order date. You will receive an email once your shipping label has been generated with your USPS tracking number. 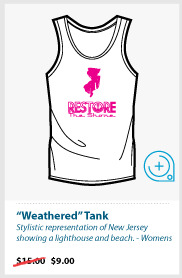 To check on your order, you can send in a request at restore@globaltechnj.com or call us at 732-929-2498. How can I check if my order went through? You will receive a PayPal confirmation email if your order went through, please give it an hour or two as the email confirmation may be backed up from the large quantities of orders. Also please check your spam email, it may have went into there. How do I order multiple quantities & sizes? To order multiple quantities and sizes, choose your size and click Add To Cart. 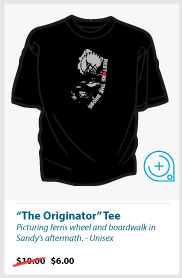 You then can go back to this page and add more sizes to your cart. You can update quantities in your shopping cart. Are your shirts true to size? 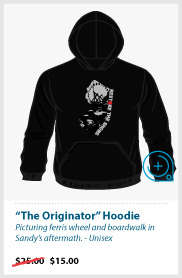 All Tees & Hoodies, except for Tanks & Youths run in Men's sizes and are true to size. Tanks run in Ladies sizes. Click here for children's size chart (5th chart down). Shipping is calculated by item and quantity. All items are shipped USPS either First Class or Priority Mail. Your order can be tracked at www.usps.com with your tracking number. We currently do not offer international shipping for online orders. Please email restore@globaltechnj.com to place an international order. (Shipping prices may vary) Any online international orders will be canceled and refunded. We DO NOT accept returns due to the fact that 100% of the net proceeds are donated to a local 501c3 non-profit. We DO accept exchanges on wrong sizes and damaged goods. To setup for an exchange please email restore@globaltechnj.com. Please allow for 1-2 business days for a response.